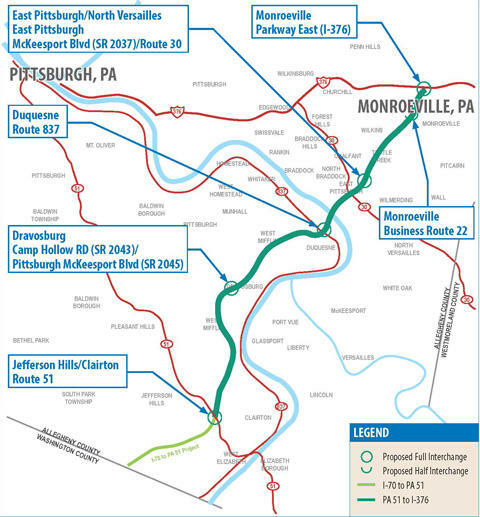 The final leg of the Mon-Fayette Expressway (in green) would create a toll road between Jefferson Hills and Monroeville at a cost of $1.7 billion, according to turnpike officials. Meetings are scheduled for 6 p.m. Tuesday at Gateway Middle School and 6 p.m. Wednesday at Woodland Hills High School. “We have the plans set up on boards throughout the room, and we have engineers around the room who are ready to talk to people individually,” said Pennsylvania Turnpike Commission spokeswoman Renee Vid Colborn. The proposed $1.7 billion toll road from Route 51 in Jefferson Hills to the eastern end of the I-376 parkway would complete a long sought-after link from Monroeville to Morgantown first begun decades ago. Colborn said many residents at the first two meetings had questions and comments about the fate of their properties, since many parcels would need to be acquired to clear a path for the 14-mile highway. “(We heard) everything ranging from, ‘Please take my property,’ to, ‘Please don’t take my property,’ and we’re honestly not at that point yet where we can acquire property,” Colburn said. Colborn said land acquisition would likely begin in 2018 if federal regulators approve the project, which was revived at a lower cost this year after being shelved seven years ago for a lack of funding. Original plans called for a spur off of the highway to lead into Bates Street in Oakland, but that would've cost an additional $2 billion and was scrapped, Colborn said. Recent transportation funding made available through Pennsylvania's Act 89 of 2013 is allowing the project to move forward. The project has been dubbed a boondoggle by some critics. Colborn said contractors and turnpike officials are still in the midst of planning and preliminary studies. A 2022 construction start would come 34 years after the turnpike commission first broke ground on the expressway’s initial segments in 1988. All kinds of signs can decorate a highway work zone. One local lawmaker wants to make sure at least one enforcing speed is taken more seriously. Joseph LaQuatra, business manager of the Laborers’ Local No. 1058, which represents Pittsburgh highway workers, said signs for speed cameras make a difference.